The Chalet is located nearby the Lake Geneva within the valesian Alps. It stands at an altitude of 1000 meters in a secluded, peaceful, rural setting. South sloped the property offers from all parts a great view. Various terraces invite to rest and meditation. Yet, modern life is available nearby like for example after a less than 10 minutes drive in the resort Morgins giving access to the area of Portes-du-Soleil. Pulsating Monthey and the mondaine town of Montreux are also close. 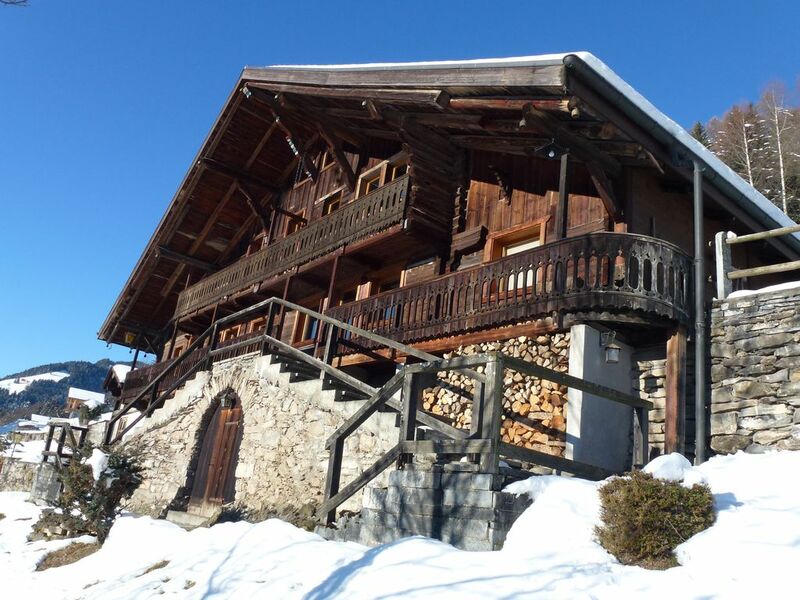 This old chalet which has been sympathetically renovated at the turn of the millenium to give all modern conveniences but also ensure preservation of its genuine, antique charm. This is exampled by the installation of efficient new central heating systems although both apartments still retain their original, working 19th century stone stove. The Chalet la Chaumière is divided into two large and luxurious apartments. The ground floor is taken by a permanent renter and the first floor is rented on a weekly basis. The Apartment on the First Floor of the Chalet la Chaumière has a living surface of 150 sq. meters. It consists of a large, light, open-plan living area with salon, fireplace, formal dining area and kitchen. On this entrance level there is also a full bathroom, a shower room, separate toilet and 2 double bedrooms plus a staircase leading to a further bedroom, a small lounge area and a games room with a pool billiard-table on the open mezzanine floor above. There are two terraces, one having a large, covered area. From the balcony you can enjoy a breath taking view over the Rhone valley and the mountains. The apartment is of high standing and has been ranked five stars by the tourist association. Please refer to the homepage for more information about the flat and the area. Since 2008 I am renovating old homes which are devoted to shelter numerous renters of all over the world. As a passionate alpinist I try to help my renters in discovering the numerous advantages of this magnificent area. On request I also accompany them on their summer or snow boot hikes, mountain bike tours and initiate them on request to rock climbing or ski alpinism. Because it is located centrally, because of the breathtaking panorama, the high standing outfit, the large living space, the closeness to various resorts and last but not least because of the moderate price for a five stars accommodation. The Chalet la Chaumière is hard to equal when it comes to it's setup and situation. A short ride you will take you to cities, various ski resorts or on the shore of the lake of Geneva.Yet you are based in a quite and secluded area. Most of the rooms, the balcony and the terraces offer an outstanding view on the Valesian Alps and on the deep Rhone valley. Mountain bike, hiking and skiing tours start on the door step. "La maison La Bergerie est très belle , dotée d'une vue magnifique et très très propre. Le propriétaire tient énormément à ce que tout soit impeccable. Il habite à côté et est disponible en tout temps. Si Patrick (le proprio) vous offre de vous préparer une raclette à la maison, n'hesitez pas, c'est délicieux, pas cher et surtout tellement agréable de boire un bon petit fendant et de déguster une raclette sur une magnifique terrasse face aux dents du midi! Que de beauté. Les pièces sont grandes, les lits confortables et la table de billard ainsi que le piano à queue agrémentent le séjour. Nous gardons un excellent souvenir de cette maison et de notre séjour en Suisse. N'hésitez pas à demander l'avis de votre proprio pour revoir votre itinéraire. Nous avons été très contents de ses suggestions. Nous étions 3 couples pour habiter cette grande maison et nous y avions chacun notre confort. Nous la recommandons aux amoureux de la nature sans aucune hésitation. If you arrive from Geneva drive in the direction of Lausanne, Gd St. Bernard, Simplon. If you arrive from Zurich or Basle follow the direction Vevey, Lausanne, Geneva. South of Bern the motorway splits in two parts at the "Weyermannhausdreieck" crossing. Follow the direction Fribourg, Vevey, Gd. St. Bernard. The highways coming from Geneva and from Basle/Zurich join near Vevey. Continue direction Martigny, Gd. St Bernard, Brig, Simplon. Take the 5th exit St. Triphon. The previous 4 exits are Vevey, Montreux, Villeneuve and Aigle. Continue then direction Monthey, Champéry. Once you arrive in Monthey please call the number 0041/79/2134959 to inform of your pending arrival and ensure a smooth hand over of the keys. A couple of kilometres after leaving Monthey you will reach a cross road leading either towards Champéry or towards Morgins. Turn left towards Champéry and drive through the town of Troistorrents. 700 meters after the railroad crossing at the end of the village, turn right into a secondary road leading to Morgins. Proceed on that road for 1.25 km, where the road makes a hair-pin bend and continue for a further kilometre. You will find to your right a narrow paved road. A modest burgundy colour sign indicating "Route des Véroz" is standing aside the junction. Turn right into this lane. The Chalet la Chaumière is about 700 meters further up the lane just where the unpaved part of the road begins. It is on the right above a hair-pin turn and can be seen above and beyond a garage. For further details please refer to the webpage www.chalet-in-switzerland.com.